The Big News: Tye Dillinger, on his last night in NXT, defeated Eric Young in a steel cage match to finally get past SAnitY. 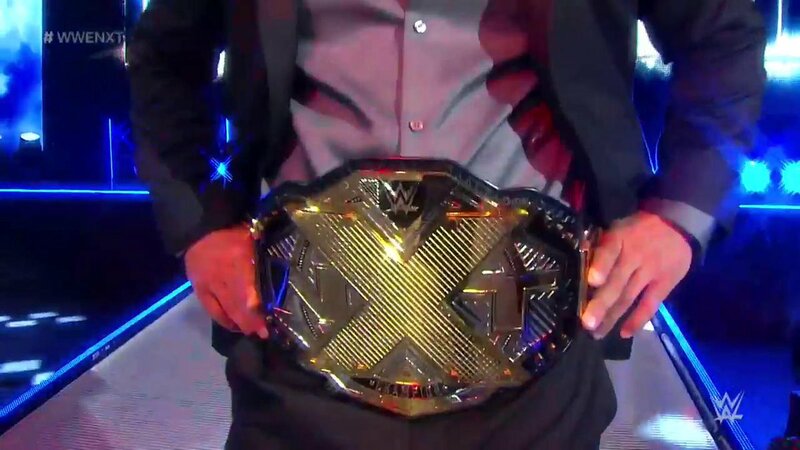 The Medium News: Hideo Itami did not approve of Bobby Roode's shenanigans, so he dropped the NXT Champion with the GTS. The Little Beaver-sized News: Andrade "Cien" Almas is a bully, but he is picking on Drew McIntyre, someone who is bigger than him. We kicked things off with the reigning, undisputed NXT Champion of the World, Bobby Roode. Shockingly it only took him two-and-a-half minutes to walk to the ring this week. Mind you this is only for an interview segment. Imagine how long it would have taken him to get to the ring this year at WrestleMania. Anyway, Roode announced for the second year in a row he made WrestleMania weekend glorious as he single-handedly sold out the Amway Center and he gave 15,000 people the treat of a lifetime and allowed them to watch the biggest box office superstar in the world today. I must have missed when they had a special screening of "The Fate of The Furious" during the show I guess. Roode did have a problem, though, with the idiots paying tribute to Shinsuke Nakamura last week, especially the pathetic fans singing his theme song. He said you saw everyone on the stage except him, and the reason why that was is because he wasn't going to listen to the crap that came out of Nakamura's mouth. He wasn't going to listen to Nakamura's lies. He stated that Nakamura didn't leave NXT, but Roode beat him so bad that he tucked his tail between his legs and got the hell out of NXT. He said that none of these people deserve or belong to be in his NXT. From now on they have two choices: either they can jump on board and be a part of Bobby Roode's NXT or they can hit the bricks like Nakamura. This brought out Hideo Itami. Roode cockily confronted him, so Itami slapped the taste out of his mouth. Roode laughed and warned Itami about messing with the champ, so Roode took off his suit jacket and rolled up his sleeves. Roode shouted that this was his NXT -- so Itami laid out the champ with the GTS. 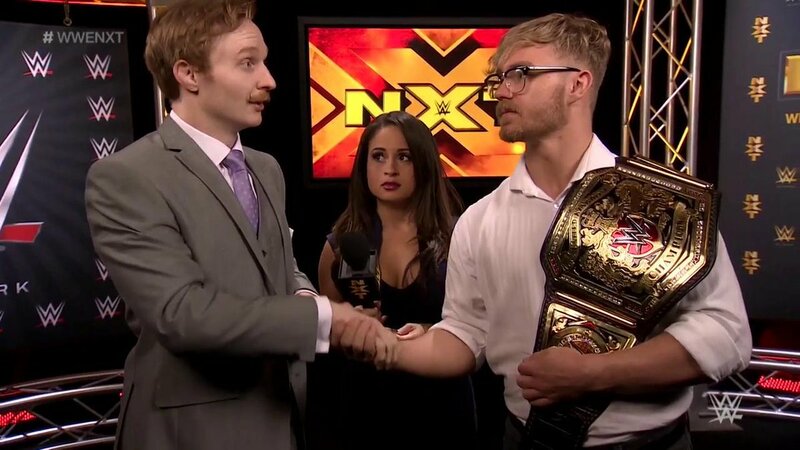 Kayla Braxton introduced Tyler Bate and Jack Gallagher, who will square off next week for the UK Championship. These two extraordinary gentlemen put each other over and shook hands. Roode was still laying in the ring after a commercial break. The fans chanted the song Smooth Criminal, but asking Bobby if he was ok. Heavy Machinery was in the WWE Performance Center, lifting weights, when Andrade "Cien" Almas bullied Drew McIntyre at 1:15 p.m. McIntyre had nothing to say, so Almas challenged him to a match next week. This was the second time where people were randomly doing stuff in the WWE Performance Center when Almas bullied someone. Thankfully they have cell phone cameras to film Almas' bullying. Speaking of bullies, Almas stopped bullying people long enough to take on Danny Burch. Almas was playing his silly games early, which Burch had problems with. However, Burch couldn't stop himself from playing silly games himself and that would lead to his demise. Almas won a quick one with the running double knees and the hammerlock DDT. An Asuka promo aired with every woman featured commenting on how dangerous she is. A video package for Tye Dillinger vs. Eric Young aired. The never ending feud between the Iconic Duo and Liv Morgan continues. The feud between these three has been going on since last June, with the heels seemingly holding a 5,000-2 advantage in the win column. In the interest of fairness since these three have wrestled 5,002 times, they have gotten better at working against each other. The fans still scream “sweet” after someone kicks out at two. Aliyah almost forgot to kick out of a Peyton Royce spin kick and then shockingly picked up the win with a sunset flip. Royce and Billie Kay threw a hissy fit after the match. For only the third time in NXT history, the cage has been lowered. Samoa Joe beat Finn Balor at NXT TakeOver: The End and then Shinsuke Nakamura beat Joe last December in Australia to retain the NXT Championship. This match was every WWE cage match you've ever seen. Except the one with Bret and Owen Hart. This was a lot of things, it even included blood, but it was not Bret Hart vs Owen Hart (which did not have any blood). Eric Young decided to pull a Bobby Roode and see how slowly he could walk to the ring. So long, in fact, that Tye Dillinger reached out of the cage and dragged EY into it. Dillinger went for the Tye Breaker early, but EY raked his eyes and threw him face-first into the cold, hard, unforgiving, steel cage. There was a lot of climbing and a lot of moves off the top rope. There were also a lot of commercial breaks for a match that went less than 15 minutes. This really came off like a show where they had giant holes in it and realized at the last minute they had to be filled in. Young all of a sudden got superkicked into the cage and was wearing the crimson mask. Yes, ladies and gentlemen, there is bleeding on WWE TV. They fought near the top of the cage and Young knocked Dillinger off the top of it. However, instead of climbing down, Young dove off the top with an elbow drop, though Dillinger kicked out. Young then told everyone to say goodbye to Dillinger, so Dillinger recovered and hit the Tye Breaker. Dillinger then tried to crawl out the door, but SAnitY ran down and wouldn't let him. Kassius Ohno and Roderick Strong were tired of these shenanigans, so they ran down, but got beat up. Killian Dain tried to climb the cage and get in (instead of going through the door), but Dillinger knocked him down and ended up fighting with Alexander Wolfe on top of the cage. Dillinger looked down at Dain (who finally got in) and Young, then dove off the top onto the heels before crawling out of the cage to victory. It took until his very last night in NXT, but Tye Dillinger has finally won an important match! Dillinger has finally defeated SAnitY. Ohno and Strong carried Dillinger away, victoriously on their shoulders. The fans chanted “Thank you Tye” as the show went off the air. That will do it for this week! Until next time, remember to say your vitamins and take your prayers!